Steven Gerrard has this lunchtime been linked with a surprise move for Manchester City’s Brandon Barker. The winger, who Mark Allen is well aware of, spent a successful spell at Hibs, including an especially impressive performance against Rangers, and is now on the Ibrox radar to follow up on the nearly-sealed deal for Liverpool winger Ovie Ejaria. 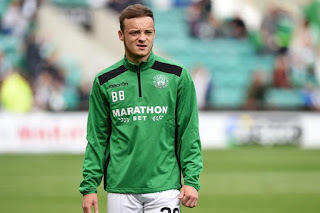 Barker, who joined Easter Road from the Etihad last summer, managed two goals and five assists in 30 appearances for Neil Lennon’s men, is unlikely to get much game time at his parent club with competition like David Silva and Kevin De Bruyne around him, and is looking for first team football at the age of 21. Hibs are rivalling Rangers’ bid for the attacker, with Lennon said to be keen on making the deal permanent, and if one thing stood out last season it was that Mark Allen brought in Nemane to Ibrox while Lennon secured Barker – one of those most definitely worked out better. Barker’s value is reported at between £500,000 and a six figure sum, and going by his impressive shows last season in Edinburgh, it would be cash well spent, and is a sure sign that Gerrard and Allen continue to be unhappy with Rangers’ wing/attacking options at present. Barker is mostly a left winger, and Rangers do have two players for that slot at least in the form of Murphy and Arfield, depending on how Stevie Ger wants to deploy them. The other side sees Daniel Candeias as the only recognised right winger in the squad. I seem to remember Barker was on the bench in the last Hibs game. Is someone who isn't first pick for Hibs really going to improve us? Hi Rob, he was still coming back from a knee injury. He'd missed three months and wasn't fully match fit yet. He seemed to have great pace, but variable end product. Didn't see anything to suggest he is better than Middleton, so while he may be a handy player to have, do we really need 4 left wingers? Mind you, SG may plan to move Murphy into the hole behind a striker and Arfield can play other roles, so there may be space. Hard to know manager's mind. Speaking as a Hibs fan, he can do some great things running with the ball, but his final product, and especially his finishing, is poor. He might be a good option as a sub, but you need to play the right system to get the best out of him. He is young so he might get better, but last season Martin Boyle was actually better for us on the other wing. We are trying to win the league and we won't do so if we keep signing mediocre players and continue being a mediocre team like the past 6 years!!! Would love to see tav with the shackles off him.